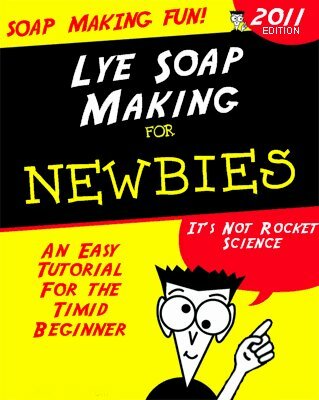 This information is dedicated to all those beginners out there who really want to try their hand at cold process lye soap making, but are afraid of that three-letter ingredient, l-y-e. I'm here to tell you, and I mean this, if I can do this, so can you. After I poured the very first plastic cup of those scary lye crystals into a pitcher of distilled water -- and realized nothing "bad" was going to happen, I relaxed and scolded myself for being such a coward. That was a few months and a few batches of soap ago and I have not yet had a mishap (knock on wood.) As long as you follow these simple directions, everything should turn out just fine. First, you need a recipe and, by trial and error, this is the formula I have settled on to make my soap. 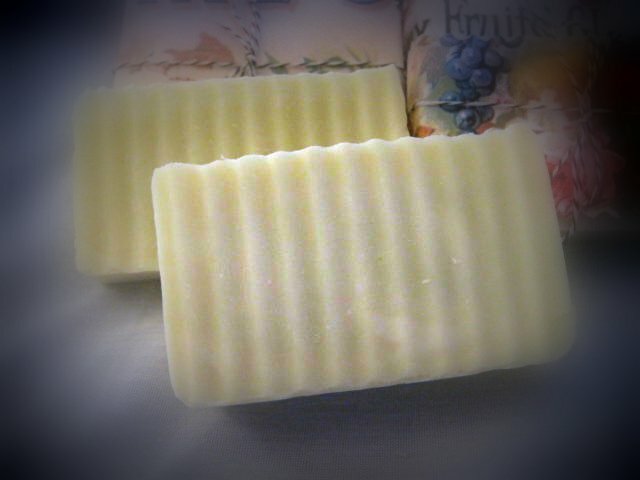 I like it because the finished soap is a bright, milky-white; lathers well; has good conditioning benefits and makes for a nice, hard bar of soap that lasts a long time. *You may follow the links to see where I purchase these ingredients online. *Please mark these items with the word "lye," using a permanent marker. Do not use these items for food preparation once they have been used for soap-making. Note: All ingredients are measured in exact weight, not volume -- this is why a digital scale is preferred. Line your soap mold with wax paper or plastic grocery bags. (Make sure any printing on the bags is turned inside-out, or the ink might transfer to your soap.) Smooth out any wrinkles and use a large rubber band or tape to secure the lining to the outside of the mold. Place the pitcher on the scale and turn on. (If the scale has a tare feature, it will weigh the container and adjust for it automatically.) Pour in the distilled water until the scale indicates the proper weight. Place plastic or Styrofoam cup on scale and measure appropriate weight of lye crystals. Pour the lye crystals into the pitcher containing the distilled water (never pour water into the lye,) and stir gently until crystals dissolve. Place the candy or digital thermometer in the lye water. Discard the cup. Weigh the solid and liquid oils. Place the second thermometer into the oil mixture. Oils are at 120 F. Too hot. Once the lye water and oils have been combined, use the mixing stick, pulsing in short bursts, to mix. You will see the mixture starting to turn milky and pudding-like, which is called saponification. to form an opaque mixture. When you can lift the mixing wand (turn it off first!) out of the mixture and it leaves a noticeable drizzle on top that lays there for a few moments, this is called trace. Add any dyes, herbs or fragrance now and mix gently to incorporate. You are now ready to pour the mixture into your mold(s). Pour your mixture into the soap mold(s) and rap each mold firmly on your workspace to remove any air bubbles. Place the soap mold(s) onto a flat surface and cover with a piece of cardboard. Wrap the mold(s) in towels to insulate -- you can't insulate too much. I use two large folded bath towels for this purpose. Cover mold with towels to insulate for 18-24 hours. In approximately 18-24 hours, your soap will be ready to un-mold and cut. You will be able to tell if it's ready when it has reached room temperature. Cut your soap into the desired size and place on racks to cure for at least four weeks, at which time it will be ready to use. 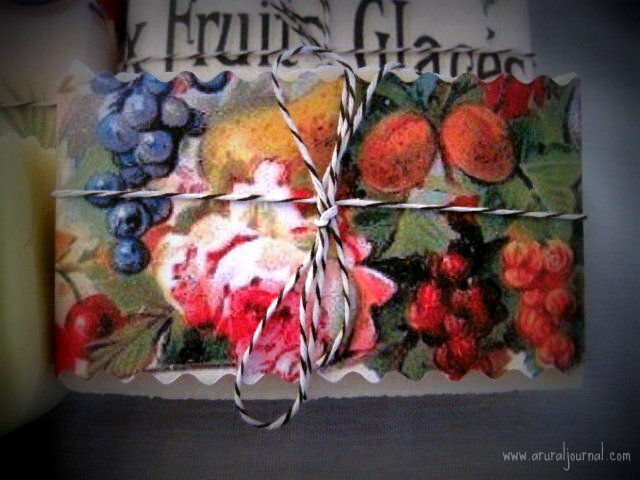 After your soap has completely cured, you can dress it up with decorative wrapping, ribbons, twine, or labels. You might even be interested in selling your soap at craft fairs, farmer's markets or online. If you should have any questions about this tutorial or soap-making in general, please feel free to do so in the comment section of this post, or email me at Lom8nance [at] gmail [dot] com. Find more articles like these at A Rural Journal. This doesn't sound very hard at all. I always wanted to make soap. I just have to order the lye, apparently. Can't wait. Nancy, this is AWESOME! My father told me that, growing up on a farm in Iowa, he would love to use his aunt's lye soap because it was so "nice on the hands". It does seem like a scary process, but the photos and step-by-step make it a very clear how-to. Could I add this to the HOMEGROWN 101 we're building? This is perfect for that! hi Nancy:) if you don't know about it already this is super handy when making soap recipes I use it often! it helps you figure out how much lye and water to use when you plug in the oils in your recipe. I'm seriously thinking about making our soap, and because of the lye issue I'm still buying it at the store but it is expensive, even more at the farmers market. Kattya, we homesteaders always seem to do a cost comparison before we try a diy project don't we? Depending on the ingredients of course, I can make my soap cakes for far less than what the stores or farmer's markets charge. If you are interested, I do have a link on my web page where you can buy 4-ounce old-fashioned soap cakes, 3 for $6.00 plus shipping. 16 oz. canola oil, 20 oz. Crisco, 12 oz. distilled water, 4.8 oz lye.